Given that today is Friday the 13th, it seemed a good time to pay my respects to the original films; the ones I grew up with as a teenager in the 1980s, and love with affection...even when they are really, really bad. 1.) 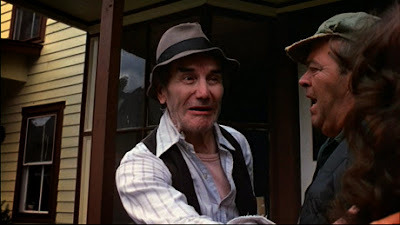 There's a consistent, Old Testament-style, conservative argument to be made in the interpretation of the old school Friday the 13th films (1980 - 1991). I describe this thesis a bit in my book, Horror Films of the 1980s, referring to it as "vice precedes slice and dice." That means, simply, that misbehaving teenagers (screwing, drinking, snorting coke, and getting high...) are punished (violently...) for their moral transgressions. Jason, whose trusty machete might as well be the wrathful Hand of God Himself, is the Punisher. The not-so-subtle subtext of these Reagan Age horrors is that if you play...you pay. 2.) There is an alternative interpretation of the Friday the 13th films too. Stated bluntly, it is implicit in the original films that Jason Voorhees -- hockey mask, machete and all -- is the natural (or supernatural...) result of a modern world in which there are no more predators for man. 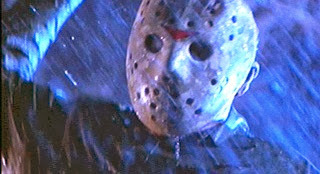 Jason is therefore but a mechanism, a response from nature, to man's invasion of a natural terrain (in this case, Camp Crystal Lake). Screening the Friday the 13th film together, it's clear that the one factor in common is not Jason himself (who, technically, doesn't appear in Part V: A New Beginning), but rather...a storm. Yep, bad weather inevitably brings thunder, lightning., and evil, serial-killer predators (whether Mrs. Voorhees, Jason, or the Jason Impostor). The arrival of bad weather is important in the various Friday the 13th narratives for practical reasons, of course. Storms knock out power (and particularly lights...) plunging frightened teens into darkness, preventing telephone calls for aid, and making the youngsters ripe for the picking off. But it's more than that. It's as if nature is rising up and rebelling against these aimless, decadent humans and Jason is the mechanism to destroy them. If Jason didn't exist, Mother Nature would have to invent him. Consider also that Jason is tied to nature in an interesting fashion: he is believed dead for years when in fact he is alive and "incubating" at the bottom of Camp Crystal Lake. 3.) The Survivors. They were no longer little women...they were final girls. 4.) The sleeping bag kill. This is a murder featured in Friday the 13th: The New Blood (1988), and it's my all-time favorite sequence in the franchise. As you may recall, Jason zips up an unlucky camper in a sleeping bag and then -- like she's a sack of potatoes -- repeatedly slams the bag and camper into a tree trunk. It's not the goriest kill; it's not the silliest kill; but in some ways this basic bludgeoning is the most brutal and -- oddly -- the funniest kill in the series. I get a kick out of it every time I see it. 5.) The Cassandra Complex. This character archetype appears in several Friday the 13th films (particularly the first, Part 2, Jason Lives and Jason Takes Manhattan). There's always a drunk stumbling around the perimeter of Crystal Lake warning oblivious teens that they're all "going to die." This Cassandra figure goes right back to Greek myth -- the tragic seer who is never believed by those in danger. 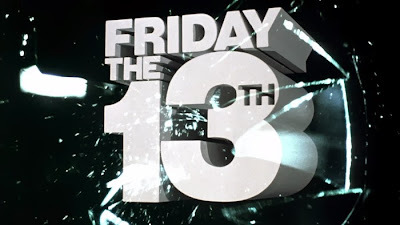 Critics and moralists can accuse the Friday the 13th films of being pandering, stupid horror movies as much as they want...but many of the entries are actually constructed with an eye towards some classic literature, both in terms of Mother Love (the relationship between Jason and Mrs. Voorhees) and in the inclusion of the discredited seer. 6.) Tom McLoughlin's sense of humor. McLoughlin directed Part VI, Jason Lives! and once more found the fun in the aging Friday the 13th saga, injecting the series with fresh blood in a number of clever sequences. The film opens, for instance, with a nod to the famous James Bond gun barrel sequence, except this time Jason is on-screen armed with a machete. The humor permeates in the film in little ways too. A child camper at Crystal Lake is seen, briefly, reading No Exit. Again, the meme that these are just "stupid" horror movies is proven wrong. 8.) 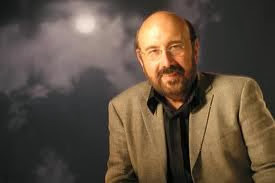 Harry Manfredini's trademark "chi-chi-ha-ha" riff. Okay, so it's not the Halloween theme by John Carpenter. But this creepy, classic composition defined the Friday the 13th sound for a generation of teenagers, entered the pop culture lexicon, and was widely imitated and mocked. 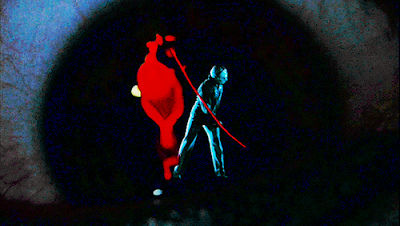 And, if I'm not mistaken, the cue is resurrected for the 2009 remake. 10.) High Concepts Gone Horribly Wrong. The makers of the Friday the 13th films attempted desperately to keep the long-in-the-tooth series going, infusing new and crazy ideas into the later sequels. For instance, A New Blood was sort of Carrie Versus Jason, an idea that sounds great on paper but doesn't play so well, especially when "Carrie's" psychic powers miss their target and wake up Jason Voorhees from his deathly slumber at the bottom of Crystal Lake. And who can forget Jason X -- which sent Jason into deep space and brought in Star Trek: The Next Generation's holodeck technology? And in the underwhelming Jason Takes Manhattan, Jason is overcome by toxic waste in Manhattan's sewers...because you know, in New York, toxic waste gets flushed through the sewers every night! 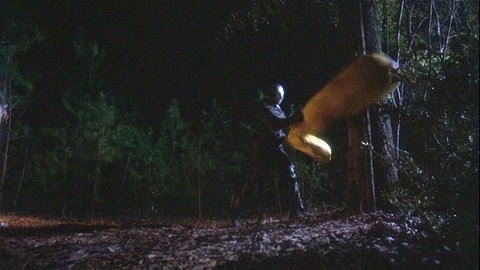 The toxic sludge doesn't kill Jason though...it just transforms, him into a pre-pubescent kid wearing his bathing suit. 11.) Amy Steel. 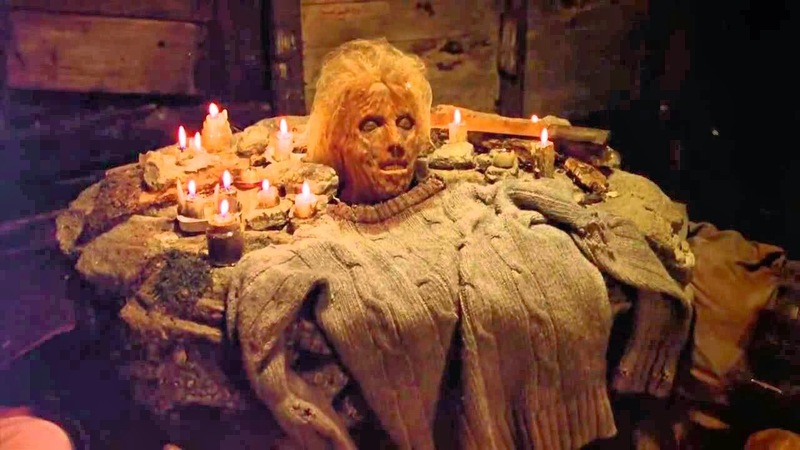 Ginny from Friday the 13th Part II is my personal favorite "final girl" in the series. Not every Final Girl can adorn a bloody wool sweater, talk sternly to Jason, and get the killer to back down. If I can't have Jamie Lee Curtis in a horror movie...give me Amy Steel any day. 12.) The Motive To Kill That Makes No Sense. So let me get this straight. Mrs. Voorhees went on a killing spree in 1980 (in the first film) because her little boy, Jason, drowned at Camp Crystal Lake in 1958 thanks to neglectful counselors. But...as the end of Friday the 13th proves...Jason didn't drown. He's still alive. So if Jason isn't really dead, why is Mrs. Voorhees after Alice (Adrienne King) and her friends? Then, Jason kills new teenagers because Alice killed his mother. But his Mother shows up alive in the lake at the end of Part III. It kind of reminds me -- in a really bad way -- of Jaws IV: The Revenge (1987). There, the great white shark wants revenge against all Brodys because Chief Brody...killed it. 13.) The sting-in-the-tail/tale from Friday the 13th. Director Sean Cunningham crafts a perfect, mind-shattering coda for Friday the 13th, even if it makes no sense in terms of the specifics of the narrative. A spent Alice is alone in a row boat, in the middle of Camp Crystal Lake when a deformed Jason Boy leaps out of the water to attack her. This sting-in-the-tale/tail is second only to Brian De Palm's Carrie (1976) in terms of terrifying impact. Everything about this finale is pitch-perfect, from the placid, idyllic look of the lake, to the tranquil, misleading music, to the sudden attack itself. Indeed, the longevity of the Friday series may originate from this unforgettable denouement (which passed the serial killer torch from Mother to Son). There you have it. Happy Friday the 13th! Here's to you, Jason...with an arrow in the eye!